On the heels of a fish kill last week in a portion of the Raritan Bay and its tributaries, another is now impacting at least two lagoons in Little Egg Harbor. Roman Isaryk snapped the above photo of what appears to be thousands of dead fish within an Osborn Island lagoon. The lagoon is connected to the Great Bay. According to Mystic Island Community Thoughts’ Rob Libonati, the kill of juvenile bunker (also known as “peanut bunker”) appeared overnight within the Ohio Drive and Kentucky Drive lagoons. 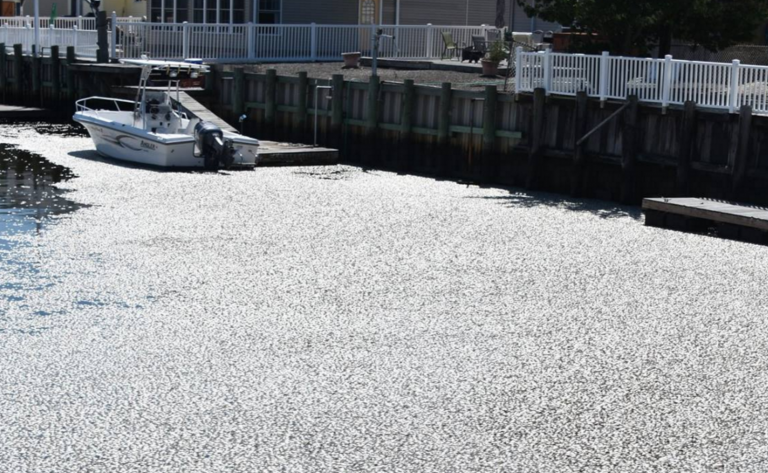 Last week, thousands of peanut bunker were spotted in Thornes and Waackaack Creeks and along the Raritan Bayshore in Keansburg. The suspected cause of death was low dissolved oxygen in the water, which causes the fish to suffocate and die. “Just like humans, fish need oxygen, but they take the oxygen from the water in which they live. Low dissolved oxygen can occur due to warm water temperatures and nutrients or organic material in the water. 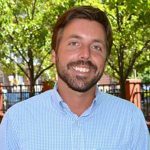 Bacteria in water can consume oxygen as organic matter decays,” a release from the NY/NJ Baykeeper said. There have been multiple fish kills in New Jersey due to various reasons in the last decade.